Virgin Orange Mojito is a perfect non-alcoholic party drink. With orange juice, a dash of ginger juice and aerated drink, this is simple, fuss-free recipe. Just mix certain ingredients, pour and serve. 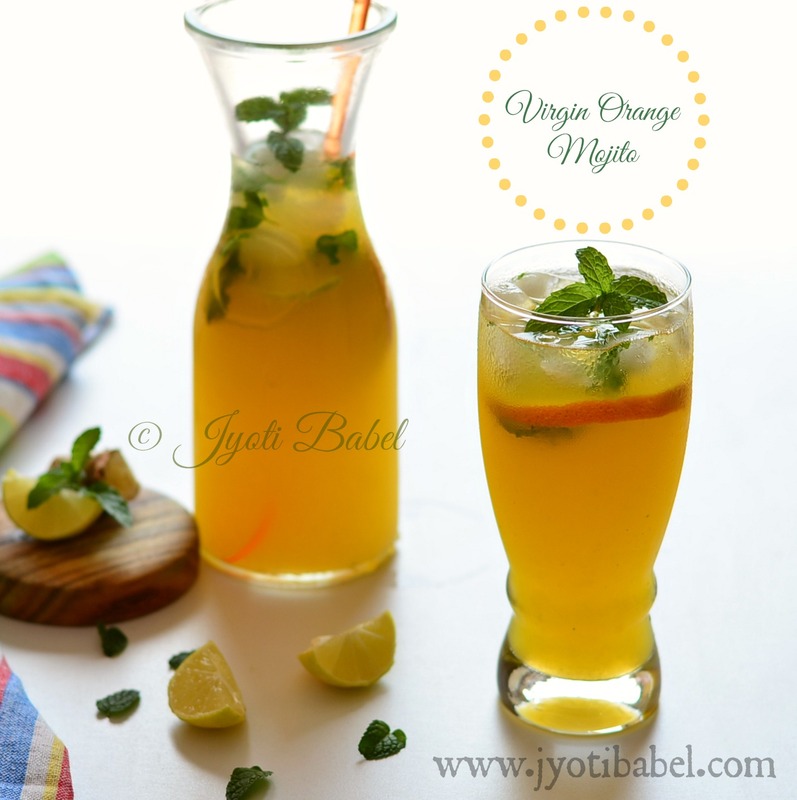 This virgin orange mojito recipe can easily be made for large parties without much issue. Both I and DH love oranges. When these fruits are in season, having fresh orange juice almost every day is a norm. But, one fine day, after we bid adieu to the Indian Nagpur Oranges, DH spotted some imported variety in the supermarket and bought a bagful home. While they looked inviting, one sip of its juice made me cringe – they turned out to be very-very sour. So, I was left with no option but to make a mocktail out of it. We all know the classic mojito in its virgin form is made of mint, lemon, little sugar and aerated water. Often sprite and ginger ale are also used. 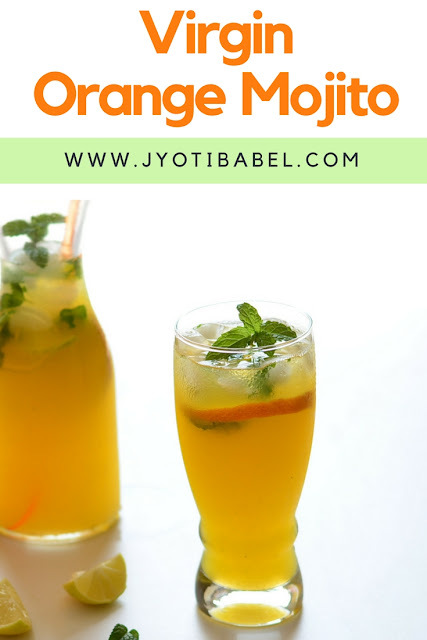 I have seen many flavoured mojito drinks doing rounds on the internet and so, I decided to use those sour oranges in making a virgin orange mojito. I like to add a bit of ginger juice in my mojitos – it adds a depth to the overall flavour. Oranges are out of season now. But, you can use packaged orange juice if you fancy to try this out. In a jar add fresh mint leaves, sugar syrup and muddle it with a spoon. Add lemon juice, followed by orange juice and ginger juice. Stir it nicely. In two tall glasses, add lots of ice cubes and pour the prepared concoction equally. Top it up with chilled sprite. Garnish with orange slice, lemon slice and a mint sprig. Enjoy! Don't forget to check out some more party drink ideas here. Irresistible, and the perfect drink to quench our thirst during this heat wave over here.